THINGS TO LOOK OUT FOR IN SONA SPEECH! A year ago this week South Africa was on tenterhooks as the State of the Nation Address (SONA) was postponed by a week because of efforts to dislodge then president Jacob Zuma from Tuynhuys and the Union Buildings. A year and a bit later President Cyril Ramaphosa will deliver what should have been Zuma's final state of the nation speech. 1. State of the nation or state of the party? Ramaphosa's second SONA (he eventually got to deliver one last year) happens months before the country goes to the polls in an all-important general election. The ANC has been buffeted by scandal upon scandal and the innards of a corrupt government laid bare in a series of commissions and inquiries into grand corruption. The party has a nervous twitch about it, but the bully pulpit offered by the Presidency is a major advantage. 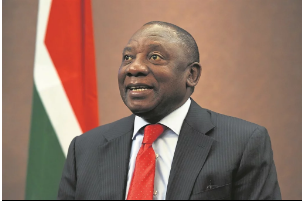 Will Ramaphosa be the statesman on Thursday evening and offer an inclusive message, or will he be the party man, attempting to extol the successes of government? Ramaphosa, in an effort to convince the international community of his sincerity in reparing the damage done to the country by Zuma, surprised all and sundry recently by labelling the presidency of Zuma as "nine wasted years". Of course, any objective oberver will be able to point to a range of key metrics to support Ramaphosa's statement (exhibit A: state capture), but it has led to internal rancour in the perennially divided ANC from those still allied to the Zupta capture project. Ramaphosa, for his presidency to succeed, must put distance between him and the corruption and incompetence of the Zuma government, of which he admittedly was part of since 2014. The governing party has been pussyfooting around its own rot for too long and it's led South Africa to a place where serious and drastic reforms are necessary. It really is five minutes to midnight. Few parties have the unrestrained braggadocio of Julius Malema's EFF. The party has always prided itself on being strong-armed and contrarian, and when they disrupted Zuma's speech in 2015 most South Africans secretly enjoyed the seemingly immovable president rattled. But the party hasn't moved on from there, sticking with their anarchic tactics in the national legislature. It refuses to operate within the system of governance to which it has been born and has again threatened to disrupt the opening of Parliament because of the Ramaphosa clan's link with the corruption tainted company Bosasa. Malema thrives on spectacle. And the state of the nation is his stage. In 2008, when former president Thabo Mbeki was ousted by the rampant and rapacious Zuma faction, Eskom was the 16th largest utility in the world, it had zero debt and its bonds were rated higher than government bonds. A decade on and the state-owned enterprise is teetering on the brink of collapse which will, if it comes to pass, take down the whole of South Africa with it. Between 2008 and 2018 the company has suffered under disastrous leadership, poor planning and fraud and corruption. Its debt levels are astronomically high and infrastructure is crumbling. Ramaphosa has now been forced to unbundle the company against the wishes of a large chunk of his own party and all his alliance partners. That's what happens when state capture becomes doctrine: you lose control of events. Eskom's break-up is the direct result of that. Beyond Eskom, there are a host of state companies that are insolvent or bankrupt, with all of them suffering from poor planning, worse leadership and rent-seeking corruptors. The SABC is on its knees, SAA is losing tens of millions of rand a week, the PIC seems like a private financing scheme and Transnet's finances are in a shambles. Most of these SOEs, like Transnet, are vital to the economy and are supposed to play a central role in resurrecting the economy, but they are in actual fact only contributing to the sky-high cost of doing business. There have been some notable advances in turning the armada of failures around. But maybe some more boards can be fired and replaced with competent directors who move with speed and urgency, like the SAA's? 6. Land reform, or, the land is ours? At the tail-end of the ANC's toxic leadership race – won by Ramaphosa against Nkosazana Dlamini-Zuma – the populist rallying call became "radical economic transformation" and "expropriation without compensation". "RET" as the former became known was dead and buried days after Ramaphosa won, but "EWC", that became the latter's moniker, became the hottest topic for the first half of the year. The sting has however been taken from it after a parliamentary committee recommended that the Constitution be amended to enable expropriation. But the ANC's version of EWC and the EFF's version – the party that made land its main election plank – are light years removed from each other. Ramaphosa has endorsed EWC with three main caveats. Will he comment on constitutional amendments? Ramaphosa's first year in office has been marked by attempts to ascertain and understand the scope and depth of corruption and capture. The Zondo commission into capture has left the nation aghast at the arrogance and brazenness of the corrupt, the Nugent commission has prised open the extent of destruction at SARS, the Mokogoro inquiry is confirming our worst fears about the politicisation of the NPA and the parliamentary inquiry into Eskom has recommended charges be laid against a raft of ministers and officials. If 2018-2019 was the year of symbolism and declaration of intent, 2019-2020 must be the year of action. People must go to jail, in orange overalls, and be locked up for 23 out of 24 hours. Commissions are great – and necessary – but prosecutions restore trust. Or, talk is cheap, but money buys the whiskey. The medium-term budget delivered by newly-minted finance minister Tito Mboweni in October last year made for grim reading. Things had regressed since Malusi Gigaba delivered the last budget of the Zuma government in February, with every single marker indicating that South Africa was caught in a low-growth and high-debt trap. Ramaphosa has attempted to talk South Africa out of trouble, visiting New York and Boston, London, Europe, the Middle East and China, hosting an investors' and jobs summit and appointing investment "lions" to champion South Africa's cause. But a difficult regulatory environment, policy uncertainty, political instability and a continued hostility towards business has hampered recovery efforts. This week's stoush with five of South Africa's biggest foreign investors shows the left hand doesn't exactly know what the right hand is doing. Clarity, people. South Africans, of every hue and colour, have been growing sceptical of the Mandela vision of a non-racial, post-apartheid country. Many feel it was a mirage and that South Africa will remain plagued by intractable racial division. The country has been shaken by periodic incidents of racism and hate speech, fuelled by an unfiltered and inhinged social media community who shoot from the hip and never asks questions or investigates motive. The Ramaphosa campaign – during the ANC's leadership race – made non-racialism a central tenet of their offering, and in his first speeches as ANC leader and head of state he started to reintroduce the unity message. Thursday's speech will be an election speech, but if Ramaphosa is going to rise up to the expectations the country's first democratic president had for him, he will have to deliver a strong message about unity and race.